Modern Beret Shape Headpiece in pretty lilac and pink colours, with "Graffiti" feather suspended the length of the headpiece. 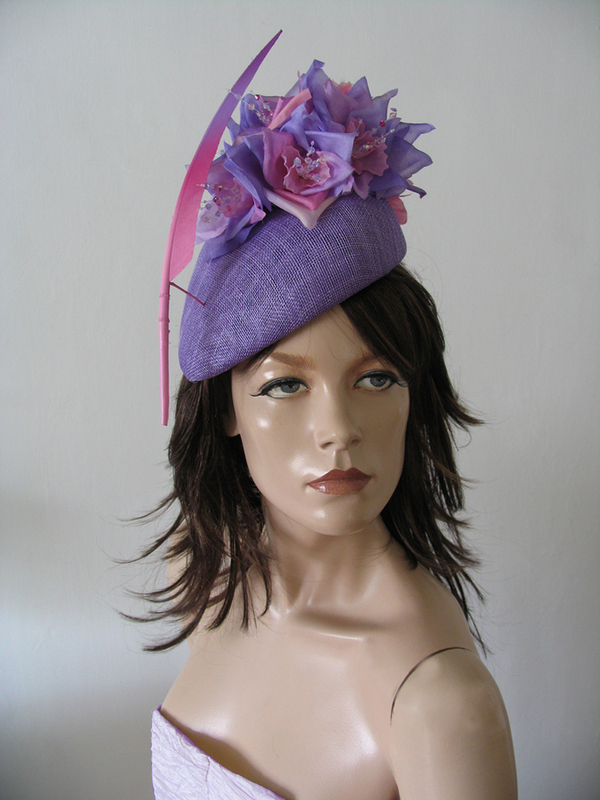 Base Beret in rich lilac, with handmade silk habutai roses in lilacs and pinks with long stemens of Swarovski crystals in pinks lilacs and clear. Fun and contemporary, while still romantic and pretty. A pretty headpiece for wearing with the current pastels trend, or with a simple lilac or candy pink dress. Beret Measures 7.5"x7.25", and has depth of 2.5". Height including feathers arrangement measures approx 6.75".